Best Chinese Knives: Zanflare F1 18650 EDC Tactical Flashlight - Great practical user! Zanflare F1 18650 EDC Tactical Flashlight - Great practical user! So I got this flashlight and would like to tell you my thoughts about it. First of all I got to say I'm not really a flashlight guy - I have 2 flashlights strictly for use. 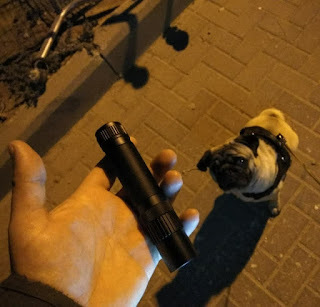 My first one is an EDC flashlight - Olight i3s I got a while ago and carried it regularly. I was very pleased with it, but I recently moved to a new apartment and started to walk the dog in a much darker park (luckily will be renovated in 1 year). 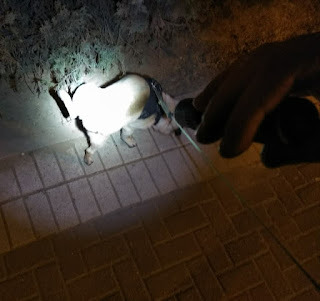 So I've tried to use my Olight AAA flashlight during the walks and it didn't give me enough light and wasn't very comfortable for 1 handed use. Plus - I wanted a tailclick flashlight with an accessible strobe mode (for obvious reasons) and a rechargeable one for comfort. After checking out some options (reading and watching reviews), I chose the Zanflare F1, mostly because of the qualities I needed - it has them all and more. Second factor was its value. All the other options with similar parameters cost a lot more. - The overall quality: The Zanflare F1 feels really solid and well made. The anodizing, the milling of the handle and the details, the fit and the finish all are done very well without any screw-ups. - One handed operation (tailclick power button (very positive click) and the mode button is accessible with the pinky finger). - The added accesories - comes with a very decent pocket clip (semi deep and has good retention), adjustable lanyard, zippered case and spare O-rings. Just the kit you need. - Comes even with a glass breaker. Haven't tested it, but seems to be usable and useful. - Ergos are good and so is the grip (provides good non slippery purchase). - The fact that its rechargeable with a built in micro USB port. No need to take the battery out, just expose the protected port, connect the USB cable and it starts to charge. That is a great idea and execution. - The price - best value for the qualities among its competitors IMO. - Comes without a battery, so need to buy those separately. - When shaken hard, I could hear a small rattle inside for no visible reason. - Has pretty substantial size and weight (for and EDC light) - almost 5.5" long and 5.31 oz (150 g) of weight (with the battery). - Me, for not using all the pro flashlight terms :). Again, this is an amateur flashlight review, focusing only on the practical side of the Zanflare F1. For my use (walking the dog each evening in a dark park and occasional camping/blackout light) it is very suitable and more than enough. The fact that it is rechargeable (through a built in USB port) gives it an advantage over other 18650 lights and the price makes it a great value purchase. I am very glad I got it and could recommend it.